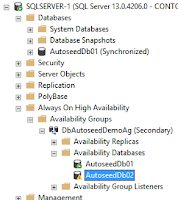 SQL Server 2016 introduced a new capability with AlwaysOn Availability Groups called Automatic Seeding. This allows you to automatically start streaming the backup using VDI across the log stream transport to the secondary replica. With this capability enabled you do not have to manually backup and restore the database and transaction logs before starting data synchronization with the primary replica. 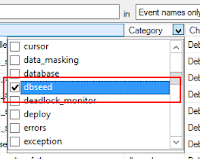 You can enable Automatic Seeding either before or after creating the Availability Group. 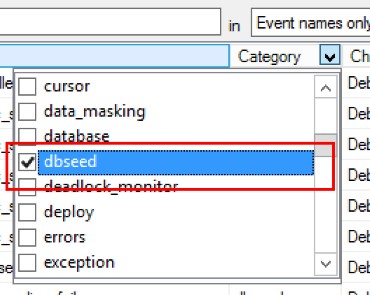 Sometimes you will find that Automatic Seeding doesn't work, in our example it will be because a data file already exists with the same name as the database we are seeding. Which is a common problem if you have previously removed the replica from the AG and are trying to re-join it. Unfortunately the UI doesn't give you any indication that seeding failed. 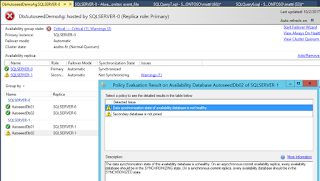 To demonstrate this I will create an Availability Group across two replicas. 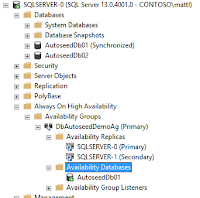 I am using the SQL Server AlwaysOn solution available from the Azure Market Place as this has an Availability Group already built, but for this demonstration I will create a new AG and Demo databases. 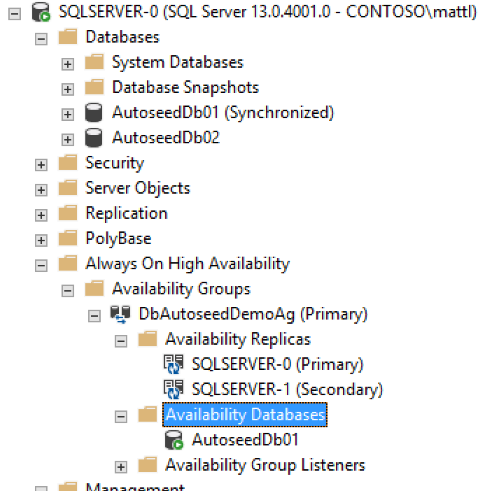 I have added an additional disk to the SQLSERVER-0 node, and formatted this new volume and assigned the drive letter G:. 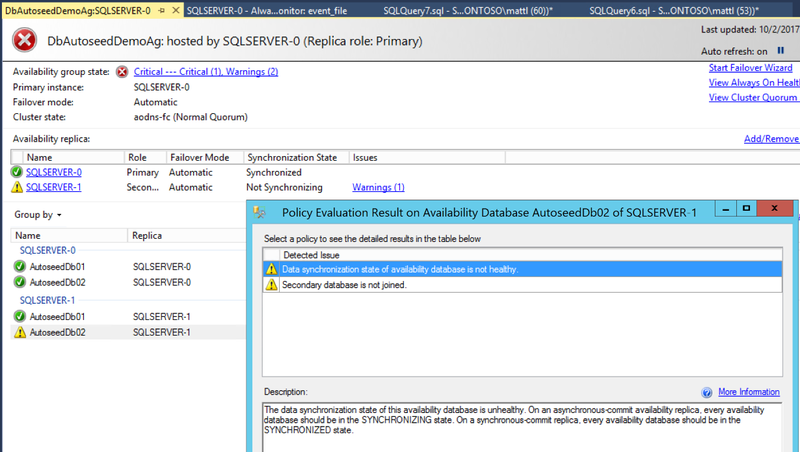 I also created the path G:\Log and set the file permissions to full control for the sql service account. The following script can be used to setup the environment. 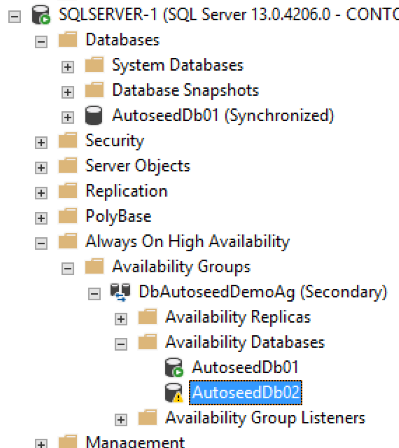 Now you should have a working Availability Group with the AutoseedDb01 synchronized and healthy between two replicas. If you want to create this manually or to explore what other events are available you will need to make sure you select the Debug channel when using the Wizard to select events. Now use the following script to add the 2nd database to the AG. NOTE: This DB has the log file on G:\ which does not exist on the replica. You will notice that the DB was not created on the replica and it is listed in the AG's DBs but with a warning. If you open the AG Dashboard you will see the warning message as well. The messages do not include much detail. We can use the following DMVs to query the status of the seeding. 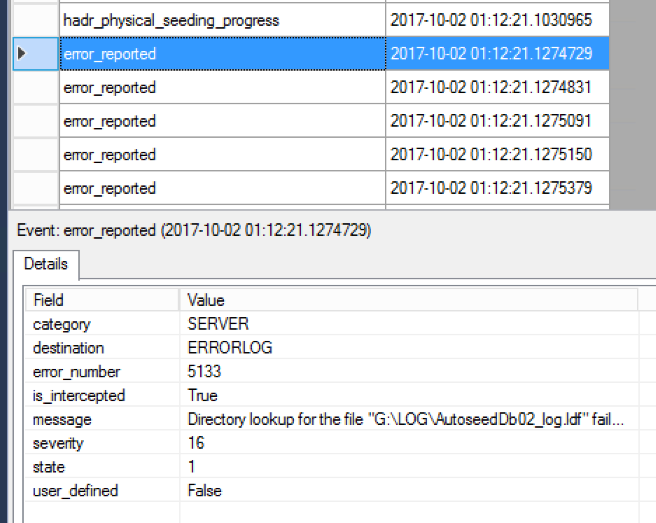 We are capturing the "error_reported" event along with the dbseed events. If you view the Event File on the replica where the failure happened. Locate the hadr_physical_seeding_progress event. There will be a lot of these events. 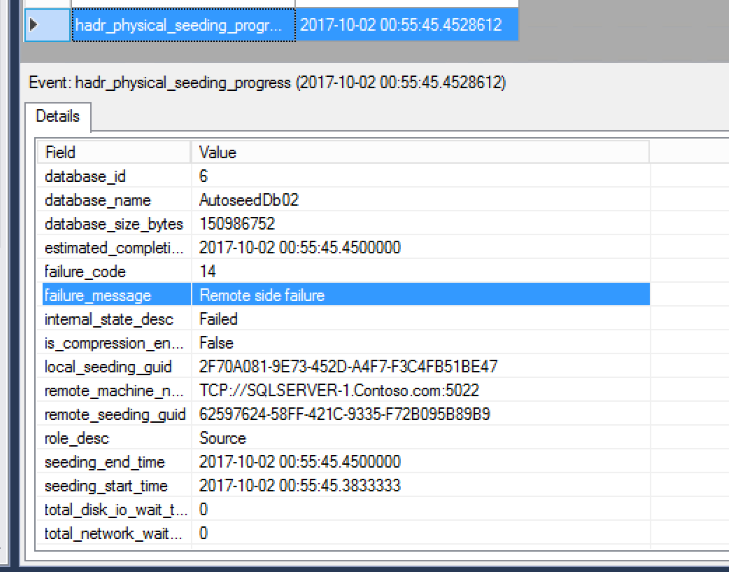 In the below screen shot you can see the progress event for one of the last stages of the seeding process where it reports the failure. 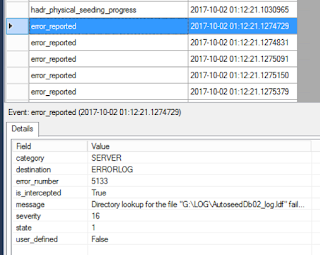 Directory lookup for the file "G:\LOG\AutoseedDb02_log.ldf" failed with the operating system error 3(The system cannot find the path specified.). There will be many more cases where this is useful. 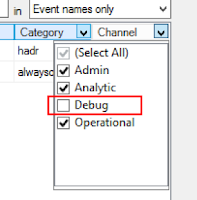 I have also used it before when I had old data or log files on the server from previous versions of a database I was adding back into the AG as sometimes that operation will fail (depending on permissions). Tips on Buying a replica here uk replica watches replica watches for men online at low prices- click to buyreplica rolex watches Explore latest collection of branded mens watches at great offers from top brands. Buy watches online at best prices in from popular watch brands such as replica watches, buy cheap sale perfect best replica fake copy discount, best breitling replica watches and more watches perfect best replica popular brands .